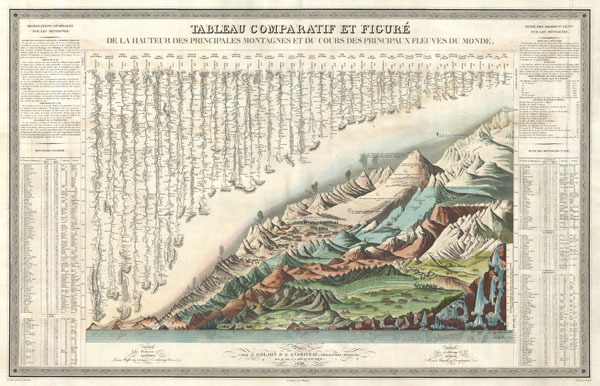 This is Andriveau and Goujon's 1838 comparative mountains and rivers chart. This extraordinary chart is considered the highest expression of the mountains and rivers convention as developed in the 19th century. No mountains and rivers chart before or after presents such a vast, detailed, and beautifully rendered tableau. Though roughly based upon Bulla's 1826 Tableau Comparatif, Andriveau and Goujon here develop the comparative mountains and rivers chart considerably by adding numerous topographical and geological notations, updating the older chart with regard to new information, redrawing the waterfalls section, incorporating textual data to either side of the chart proper, and adding a sub sea level element. Even the ballooning feat of Gay-Lussac who attained an altitude of 7000 meters in 1808 is noted. The comparative mountains section, occupying the lower right half of this chart, details the principle mountains of the world. Ranges are color coded to show different types of vegetation and numerically reference tables to the left and right of the chart proper. The elevation of a number of important cities including Paris, Rome, London, Geneva, Mexico, Bogota, and Quito, among others, is noted. There are also extensive notations on vegetation, volcanic activity, and lichen, much of which is no doubt influenced by Humboldt. The Himalayan peak Dhaulagiri is identified as the world's greatest mountain. A waterfall chart occupies the extreme bottom right with the Pyrenean waterfall of Gavarnie identified as the world's highest. This is a rare opportunity to own one of the finest comparative mountains and rivers charts to appear in the 19th century. Very good. Backed on linen. Original centerfold. Minor flattened crease at right hand side of chart. Blank on verso. OCLC 953572390. Walter, John A., The Heights of Mountains and the Lengths of Rivers.